Time allowed is 20 minutes. The Online Data Sufficiency Test Series 1st, Online Data Sufficiency Test Exam is Very helpful for all students. Now Scroll down below n click on “Start Quiz” or “Start Test” and Test yourself. Conclusion II, affirmative, does not follow. From the above diagram, conclusion I follows. Among five friends who is the tallest? I. D is taller than A and C.
II. B is shorter than E but taller than D.
If the data in both the statements together are needed. From I, we have : D > A, D > C.
From II, we have : E > B > D.
Combining the above two, we get : E > B > D > (A and C). So, E is the tallest. Clearly, both the statements are needed to answer the question. At what time did Sonali leave her home for office? I. Sonali received a phone call at 9.15 a.m. at her home. II. Sonali’s car reached office at 10.15 a.m., 45 minutes after she left her residence. From statement II, we conclude that Sonali left her home 45 minutes before 10.15 a.m. i.e., 9.30 a.m. Thus, only II is needed. All green things are fresh. I. All trees are fresh. II. 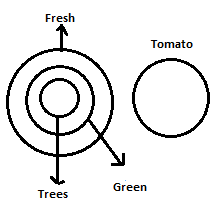 No trees is a tomato. III. No tomato is green. 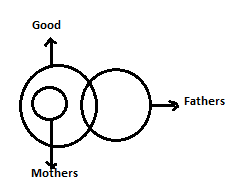 The given statements can be represented in the following basic diagram. As negative conclusion follows, let us try to negate through an alternate diagram. The negation of conclusion II is “Some trees are tomato” and negation of III is “Some tomatoes are green”. We cannot draw an alternate diagram for conclusion II and III, hence II and III follow. In a certain language, ‘pit nac mit’ means ‘red pant shirt’. Which word means ‘pant’ in that language? I. ‘mit tim nac sir’ means ‘he wore red pant’. II. ‘nee jic pit’ means ‘shirt is dirty’. Clearly, from each of the statements, we find that the code for ‘pant’ is either ‘mit’ or ‘nac’. So, none of them is sufficient to answer the question. Some lights are not shine. I. Some shine are not gold. II. All shine are gold. III. Some shine are bright. IV. No gold is a shines. 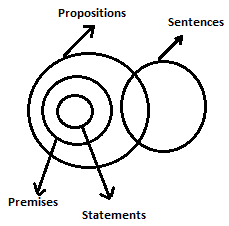 The given statements can be represented in the basic diagram as follows. Conclusion II, affirmative, does not follows. Conclusion III, affirmative, does not follows. Conclusion IV, negative, does not follows. 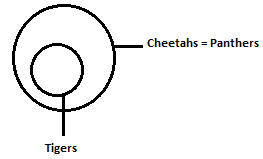 As the negative conclusion follows, let us try to negate through an alternate diagram to negate it. 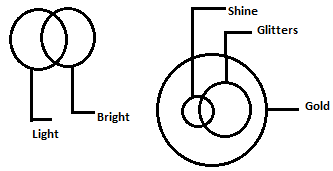 The negation of I is “All shines are gold”. Conclusion I is negated, but conclusion II which did not follow earlier, follows now. Hence, either I or II follows. I. Some white are black. II. Some black are blue. III. No red is blue. IV. No white is black. Conclusion IV, affirmative, does not follows. As the negative conclusion follows, let us try to negate through an alternate diagram. 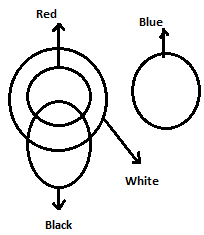 The negation of II is “Some red are blue”. We cannot draw an alternate diagram for conclusion III, hence III follows. Both I and III follow. 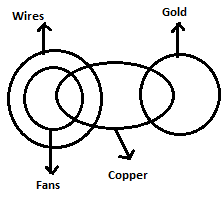 Some wires are made of copper. No copper is made of gold. I. No fan is made of copper. II. Some copper are gold. III. No copper is made of gold. IV. Some fans are made of coppers. 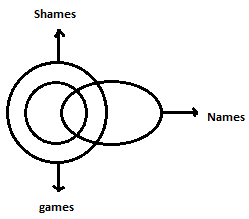 The given statements can be represented in the following basic diagram as follows. 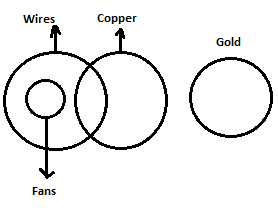 The negation of I is “Some fans are copper” and negation of III is “Some coppers are gold”. Conclusion III is negated, but conclusion II, which did not follow earlier, follows now. Either I or IV and either II or III follow. I. Some games are names. II. 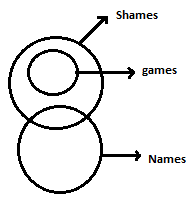 No game is a names. Conclusion I, affirmative, does not follow. As the negative conclusion follows, let us say to negate through an alternate diagram. The negation of conclusion II is “some games are names”. Conclusion II is negated, hence II does not follow, but I follows. Either I or II follows. What is the amount of rice exported from India? I. India’s export to America is 80,000 tonnes and this is 10% of the total rice exports. II. India’s total export tonnage of rice is 12.5% of the total of 1.9 million tonnes. From statement II, we conclude that the total amount of rice exported from India is (12.5% of 1.9 million tonnes). So, the answer to the given question can be derived from statement II alone. In the last month the company decided to increase the cost of its mixer by 10%. What is the present price of the mixer? I. The cost of mixer and juicer together was Rs. 2850 a month ago. II. The amount of 10% increase on the mixer comes to Rs.220. Let the earlier price be Rs.x. Then, 10% of x = 220 or x = 2200. Present price = Rs(2200 + 220) = Rs.2420. So, only II is needed. I. 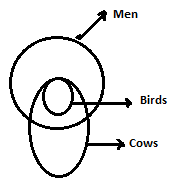 Some men are cows. II. All cows are men. From the above diagram both conclusion I and II are affirmative and follow. Total money with Naresh and Ajay is 28 percent of that with Usman. How much money is Ajay having? I. Usman has got Rs.75000. II. The ratio of money of Naresh to money held by Ajay is 1 : 3. Total money with Naresh and Ajay = Rs(28/100 * 75000) = Rs.21000. From II, we find that money with Ajay = Rs(3/4 * 21000) = Rs.15750. So, both I and II are required. I. All fathers are mothers. II. Some mothers are fathers. Neither I nor II follows. All brave people are Trojans. I. All brave people are Greeks. II. All Greeks are brave people. III. 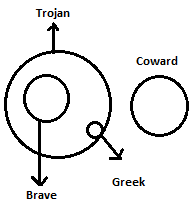 No Greek is coward. IV. No brave is coward. The negation of III is “Some Greek are cowards” and negation of IV is “Some brave are cowards”. We cannot draw an alternate diagram for conclusion III and IV, hence III and IV follow. Only III and IV follow. From the above diagram, both conclusion I and conclusion II follow. I. Some solids are gases. Conclusion II, is not possible. 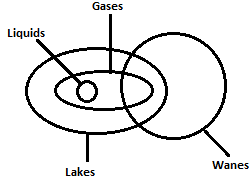 Since it is given that no liquid a solid, there we can say that All gases are liquids is not possible. Hence conclusion II, does not follow. How many gift boxes were sold on Monday? I. It was 10% more than the boxes sold on the earlier day i.e., Sunday. II. Every third visitor to the shop purchased the box and 1500 visitors were there on Sunday. From II, we can conclude (1500/3) i.e., 500 boxes were sold on Sunday. From I, we find that number of boxes sold on Monday = 500 + 10% of 500 = 550. Conclusion II, affirmative , follows. Conclusion III, affirmative, does not follow. Only I and II follow.